This year, “Christmas in Special Collections” is a small exhibit in two cases on the first floor, since the second floor renovation has limited access to Special Collections. Bente Polites, Special Collections librarian, chose two large and richly illustrated works for this annual display: a facsimile of the Gutenberg Bible and a 1773 edition of a Missale Romanum (or Roman Missal). The Gutenberg Bible (Biblia Latina) was printed at Johann Gutenberg’s shop in Mainz, Germany, and it was completed in the 1450s. Johann Gutenberg (c.1400-1468) was the inventor of the printing press that used movable type. His invention eventually made possible the mass production of printed books. Only about 50 copies of the original Gutenberg Bible survive. The Nativity story in the Gospel of Luke is featured. Be sure to look at the two ornately decorated letters. This type of large, colorfully decorated letters originated in the time of hand written manuscripts. 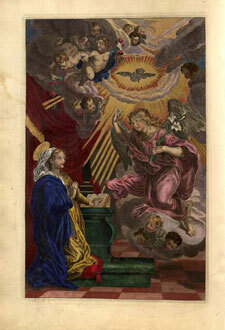 The large Q in the second column of the left-hand page contains a haloed, winged beast, the emblem of St. Luke. 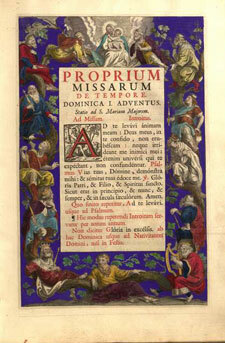 Printed in Antwerp in 1773, the Missale Romanum contains the official texts for the celebration of the Mass in the Roman rite of the Catholic Church. The Roman Missal is opened to a full-page hand-colored illustration of the Nativity and facing it is a colorfully decorated page with part of the “Proper Mass” for the first Sunday of Advent. This is a small exhibit, but the contents are well worth contemplating, both for their religious content and for the colorful art.